464 pages | 67 B/W Illus. 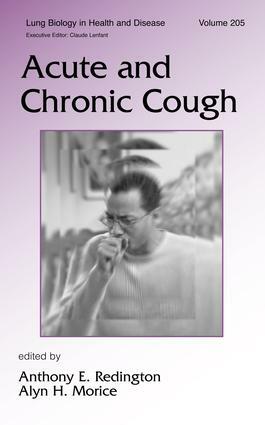 A comprehensive review of the scientific and clinical aspects of acute and chronic cough, this reference focuses on recent developments in our understanding of the molecular biology of putative cough receptors, the neural mechanisms involved in the afferent and efferent limbs, the central processing of the cough reflex, and peptides and other substances that may mediate or modulate the cough reflex. With chapters written by acknowledged authorities in the field, this handbook covers current and potential therapeutic agents, various methodologies to measure cough reflex sensitivity, and clinical approaches for the assessment of chronic cough in adults and children. "…I congratulate the editors on assembling an international field of true experts in the many clinical and scientific aspects of cough."